bliss's default file organisation patterns replace whitespace with underscores. The reason for this is simple: it's how I like it. replacing spaces with underscores helps with scripting and command line control of your music files, and as I am a Linux user and command line enthusiast this works for me. However, not everyone is this... weird... and to many the aesthetic appearance of their filenames matter more. I can't claim that using underscores is any more beautiful than spaces; I recognise the opposite is the case and to many underscores may appear downright ugly. While preserving spaces is not the default for bliss, it's easy to configure using a custom file organisation pattern. These custom patterns give full control over for and folder names. Ok, so as expected the Expected path contains underscores. Here's the clever bit: the whitespace separator is defined by the character between the words in textual tokens. 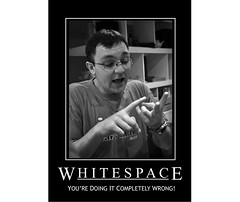 The whitespace can either be an underscore (as above), a hyphen, zero length or (pertinently) a space. Thanks to psd for the image above.